This photo gloss white pearlescent label material is unique in its water resistance and took us years to find. It is a super high gloss .005" thick white polyester that is waterproof after being printed with a standard desktop color inkjet printer. The permanent self adhesive was designed for best adhesion to metal and inside window glass (will work on rigid plastics if tested first). The material is opaque and can be used as a cover-up label and will allow limited light through if placed on a window. This material is waterproof. 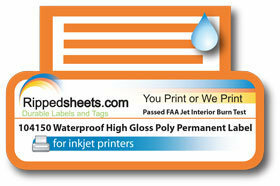 If you submerge the label in water for short periods of time the color inkjet inks will not fade. 104150 has passed the Federal Aviation Administration burn (heat fire burn flame suppressant) tests in an FAA certified repair facility in 2007.